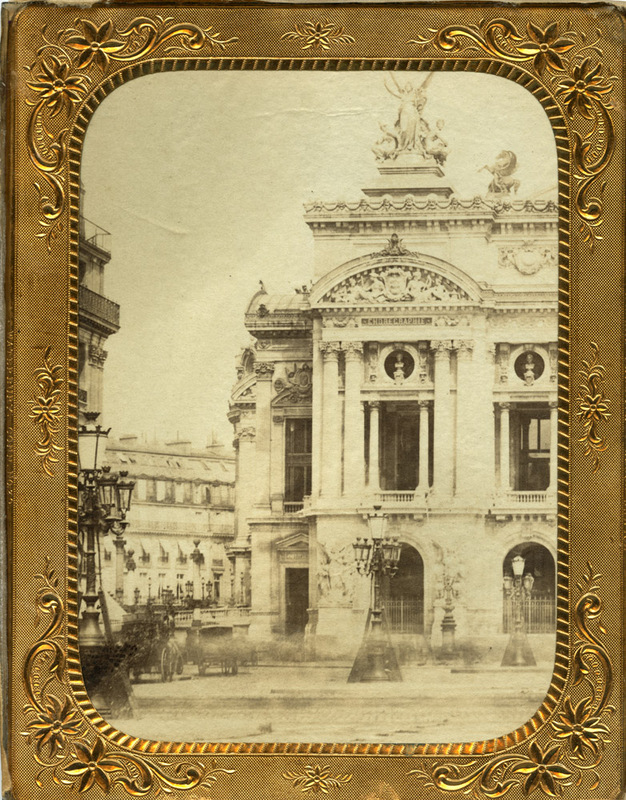 Here is an oddity – a cased albumen print of the Paris Opera house, taken shortly after it opened. The Opera was commissioned in 1861, and completed in 1875. The image could be as early as 1867, when the facade of the not-yet-completed opera house was bared of its scaffolding for the first time. This was taken with a wet-plate camera – notice the foggy foreground? That was pedestrian traffic blurring in the long exposure required by the collodion emulsion. The oddity is that someone would have put this in a brass mat and case (the case is now missing), and not presented this as a cabinet card or some other mounted paper format. This image provides a cautionary tale for collectors – nothing went terribly wrong, and I don’t think I grossly over-paid for it, but when it was listed, it was described as a salt print from a calotype negative. I assumed from the brass mat that this description was accurate. Upon receiving the item, it became obvious that it was NOT a salt print (one easy way to tell is the gloss of the paper surface) and that it was NOT from a calotype (calotypes are paper negatives and are generally softer and more lacking in detail than an image from a glass or film negative). The image was purchased from a dealer in France, who acquired the image from someone in Romania, as evidenced by the inner envelope the image arrived in. The outer envelope was marked with my proper address here in the United States, but the inner envelope had stamps and a return address from Romania. Pretty cool, eh? Kinda like that photo I have of an Osage brave from the Arkansas territory – it started life in Arkansas, was collected in New York, then ended up in Paris, and I bought it and brought it back to the US. It just shows that like houses and cars, photographs have a life of their own and we are mere custodians for the next generation.